Electric Motorcycles & Scooters Market size was valued at over USD 15.5 billion in 2017 and will exhibit 5% CAGR from 2018 to 2024. Increasing consumer awareness towards climate change in conjunction with implementation of regulations for pollution control & environment conservation will fuel the electric motorcycles & scooters market share from 2018 to 2024. Stringent norms across the globe with focus on reducing dependency on fossil fuel and supporting clean energy to enhance the air quality will influence consumer buying behaviour. Government is offering subsidies and incentives to OEM and customers to improve the product penetration. Less maintenance compared to gasoline vehicles along with emission free drive of these vehicles will further support the business growth. Favourable demographics and ease offered in the transportation have resulted in higher adoption of the electric motorcycles & scooters in the emerging countries. China & India have superior penetration of two-wheelers as these offer less traffic congestion and comparatively less cost as passenger cars. Several manufacturers are adopting a combination of direct and indirect distribution channel to attract more customers and make distribution simpler. The OEMs are facing challenges of establishing strong distribution network and product customization as the industry is highly competitive, particularly in Asia Pacific. Thus, manufacturers are focusing towards building direct distribution channels through building various B2B customers and adopting e-commerce channels for electric motorcycles & scooters sales. Lack of infrastructure for battery charging along with deprived performance of electric vehicles (EVs) is expected to be a major barrier for the electric motorcycles & scooters market size. High costs associated with these batteries along with performance restrictions and travelling range pose potential threats to the suppliers. Electric motorcycles manufacturers are offering products with superior power requirements and enhanced speed. The segment is expected to witness strong gains at over 10% from 2018 to 2024 owing to introduction of new products with reducing overall cost. For instance, in 2015, Zero Electric Motor Cycles and Brammo Electric Motorcycles upgraded their product portfolio while cutting down the prices on all e-motorcycles models. Electric scooters have lower cost compared to motorcycles. Asia pacific is the major customer of the product. The region is largely driven by price competitiveness. Companies are investing heavily in R&D to increase the vehicle performance, sales and decrease overall cost. Upgrading the existing product portfolio is among major strategy adopted by the industry players. SLA batteries is estimated to hold maximum electric motorcycles & scooters market share accounting for over 85% in 2017. This can be credited to low price of the product, ease in compatibility with the EV and vast presence of battery manufacturers in Asia Pacific. However, the segment is expected to lose its market share owing to strict regulations regarding the recycling issues of these batteries. 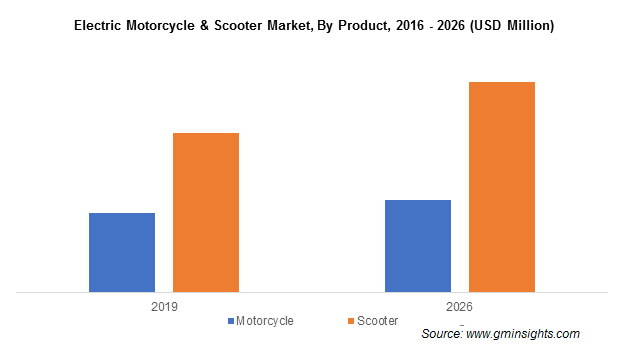 Lithium-ion battery-equipped electric motorcycles & scooters market share is expected to witness strong growth at over 11% from 2018 to 2024. The batteries are preferred due to low weight compared to lead acid alternatives. These are efficient in terms of both discharging and charging. While the upfront costs are higher, growing electric vehicles adoption on a global scale is forecast to make prices competitive, further fuelling consumption. The reliability of electric two-wheelers lags far behind in terms of performance as compared to conventional products. The vehicle performance is driven by battery-capacity, charging time, and the power output. Currently, the market faces challenges of slow acceleration and low torque. Government is constantly focusing on improving the infrastructure and offering charging stations at regular distance. Improvement in the power output of electric vehicles is key trend adopted by the manufacturers. 48V batteries are highly adopted and are estimated to account for 35% of electric motorcycles & scooters market share in 2017. The higher adoption can be credited to ability of the product to achieve the desirable power output competing with the conventional two-wheelers installed with internal combustion (IC) engines. Higher compatibility of the product with the scooters will fuel the market demand. Electric motorcycles & scooters installed with superior power output 60V & 70V will witness strong growth over the forecast time frame. E-motorcycles offering superior speed along with value addition offered such as sturdy body and enhanced aesthetics will drive the industry demand. Industry players are competing the electric two-wheelers with the conventional vehicles, with products offered at comparatively less price. Asia Pacific dominates the overall industry share owing to strong sales of the product in China, India, Indonesia and Japan. Significant pollution levels and changing consumer preferences will result in continuing regional dominance in the coming years. In addition, high population resulting in traffic congestion in the country is the key factor for electric motorcycles & scooters market dominance in the country. The U.S. electric motorcycles & scooters market has witnessed strong growth at over 16.4% owing to regulatory support for product adoption, including R&D investments and competitive programs for encouraging vendors to invest in infrastructure. In May 2014, eight states unveiled the action plan of putting 3.3 million zero emission vehicles on road by 2025. In November 2016, the Obama Administration announced establishment of 48 national EV corridors charging networks in 35 states at 25,000 miles interval on highways. Global demand is considerably dependent on electric motorcycles & scooters market price trend. The ecosystem consists of numerous Chinese E suppliers such as Sunra, AIMA Hi-tech, Zhejiang Ripu Electronic Science and Technology, Qingdao AUCMA, Feishen, Electric Vehicle Manufacturing Co., and Shanghai Lima. Increasing awareness regarding the business has increased focus of automotive OEMs towards hybrid technologies. For instance, Harley Davidson launched their electric bike, LiveWire in June 2014. As the company is known for its big touring bikes, it is focusing on EVs to be launched in the U.S. by 2021. In 2016, Yamaha launched two EVs, Passion E-Street and Passion E-Dirt, providing 62 mph highway speeds. 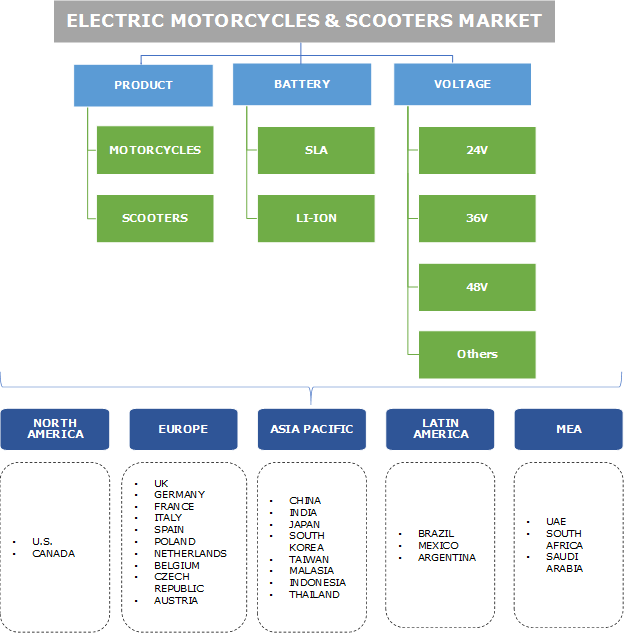 Electric motorcycles & scooters market includes electricity powered two-wheelers which are installed with rechargeable batteries. The battery powers one or more motors which is attached to the rear wheels. The motors used to drive the vehicles are usually DC permanent magnet motors which provides higher torque. These products provide higher speed and longer range compared to gasoline powered bikes. With development in battery used in the motors, the charging time of the battery can be reduced, and its run time can be increased.